Are you looking for a delicious vegetables recipe with a difference? If you are, you’ve found it! 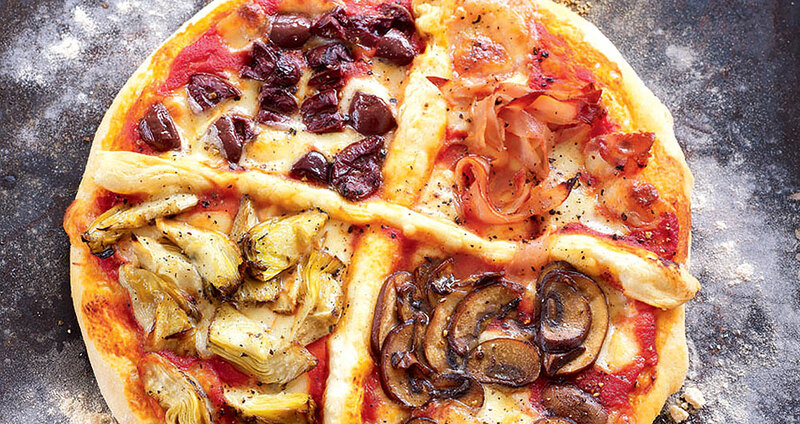 Here’s my four seasons pizza topped with ham, artichokes, mushrooms and olives for you to enjoy. Globe artichokes are used a lot in Europe, and especially in Italy, but don’t seem to be very popular here in England. However, artichoke hearts are essential on this pizza as they work beautifully with the ham, mushrooms and olives. I have tried making this recipe with rocket leaves instead of the mushrooms and it’s just as good. A classic Italian four seasons pizza that just reminds me of home. Makes 2 pizzas. 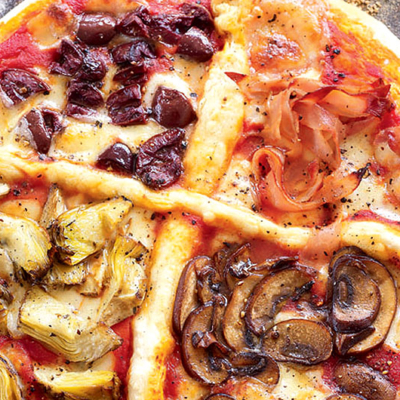 Feast your eyes on the finest four seasons pizza topped with ham, artichokes, mushrooms and olives! It’s straightforward and fun to make this great dish. Simply follow the instructions below and get the perfect result. Prepare two baking trays by pouring 1 tablespoon of oil in each tray and spread it with your fingers or pastry brush. Brush the inside of a large bowl with oil. To prepare the topping, heat the oil in a large frying pan over a high heat, and fry the mushrooms for 5 minutes stirring frequently. Season with salt, leave to cool and set aside. To prepare the dough, place the flour, yeast and salt into a large bowl, make a well in the centre and pour in the water with 1 tablespoon of oil. Use a wooden spoon to mix everything together to create a wet dough. Turn out the dough onto a well-floured surface and work it with your hands for about 5 minutes or until smooth and elastic. Place in the oiled bowl, brush the top with oil and cover with clingfilm. Leave to rest at room temperature for 25 minutes. Once rested, turn out the dough onto a well-floured surface. Roll 4 little pieces of dough into 22cm-long strings, and set them aside. Divide the remaining dough into two equal halves. Use your hands to push each one out from the centre to create 2 discs about 22cm in diameter. Gently lift the pizza bases onto the oiled baking trays. Spread the passata evenly over the bases using the back of a tablespoon and season with salt and pepper. Scatter the mozzarella cheese on top. Use 2 dough strings per pizza to make a cross on top of each. Press the ends of the strings onto the edge of the base to secure. Both pizzas will have 4 triangle shapes. Fill one triangle with olives, one with ham, the next with artichokes and the last with mushrooms. Cook in the middle of the oven for 18 minutes until golden brown. Serve hot and enjoy. 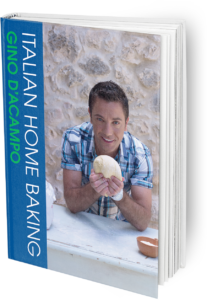 Once you’re done, simply sit back and enjoy your four seasons pizza topped with ham, artichokes, mushrooms and olives and don’t forget to check out other great authentic Italian recipes including great antipasti recipes, Italian pasta recipes, Italian soup recipes, Italian beef dishes and authentic pizza recipes.